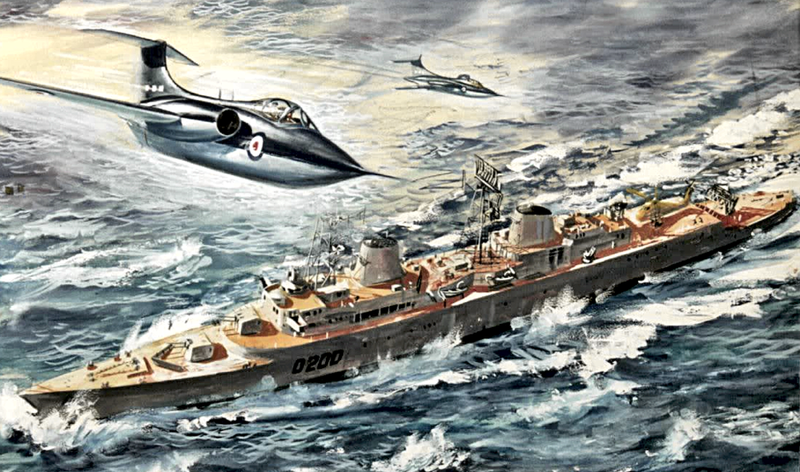 SMN report: The hugely talented Roy Cross was the man who painted a galaxy of Airfix box tops, especially in the 1960s. Roy's subject matter ranged as far and wide as the Airfix range itself. So the subjects were mostly military World War II era aircraft, but with plenty of others too, from early biplanes to the latest jets, and plenty of naval vessels. The Avro Anson (below) was a British twin engine machines that operated in the training, patrol and air/sea rescue roles. The skill of Cross lay in combining photo-like accuracy, with scenes that were usually packed with exciting, or as here, interesting details. 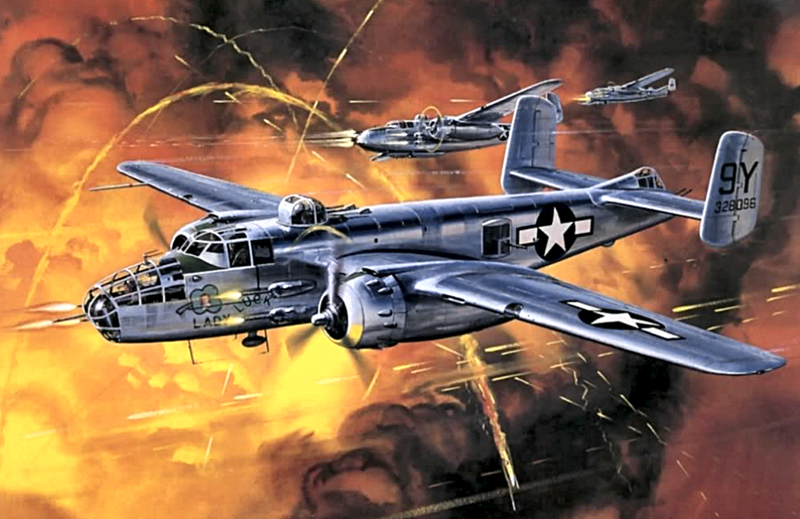 The US North American B-25 Mitchell bomber (below) became famous for its exploits in the Doolittle Raid on Tokyo, in 1942. The scene here is slightly unusual, as Roy has concentrated on fire and flames behind the bomber group. More often he included plenty of minutiae into his paintings, to give the mostly young buyers something to look at beyond the subject itself. The Boeing B-29 Superfortress (below) began service operations in May 1944. 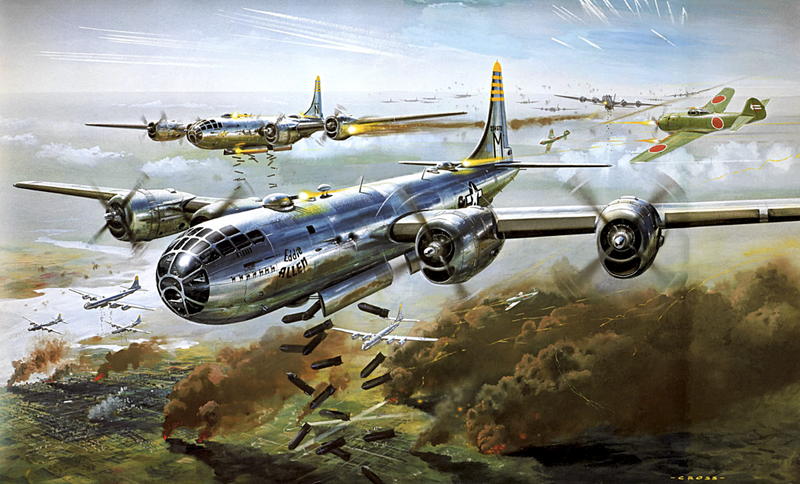 Here, Roy shows a group of B-29s dropping full sticks of conventional bombs, while being harried by air-to-air attacks from Japanese fighters. In 1945, two specially-modified B-29s (so-called Silverplate versions) became infamous for delivering the atomic bombs Little Boy and Fat Man over Japan. 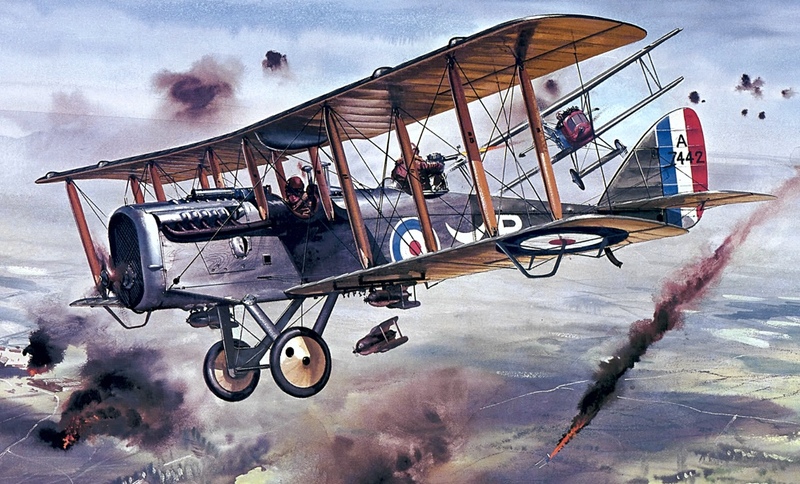 Among the World War I types in the Airfix list, the Airco DH4 (below) was painted by Roy during a medium-level bombing raid. The pilot unloads the bombs, just as an enemy fighter closes in, and the gunner has his hands full in the rear, shooting at the oncoming aircraft. The kit was to 1:72 scale, and the art made the DH4 look somewhat more exciting than the finished model. For younger model makers, assembling those interplane struts often became a nightmare of misalignment, with blobs of cement pooling in unexpected places. A clever idea from Airfix (below) was the Dogfight Double, a pair of opposing machines inside the box, echoed by Roy's artwork on the outside. 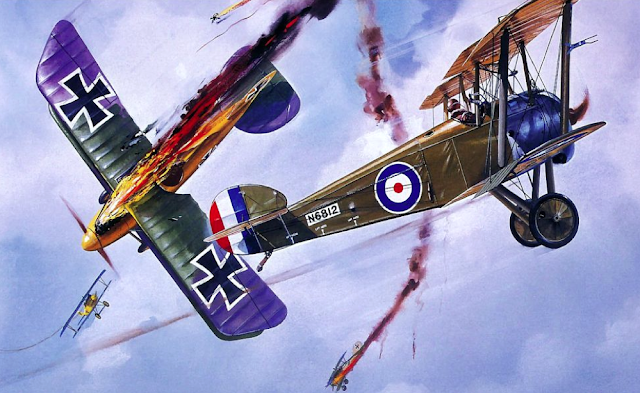 Here, a German Albatros goes down in flames, while a British Sopwith Camel flies victoriously past. 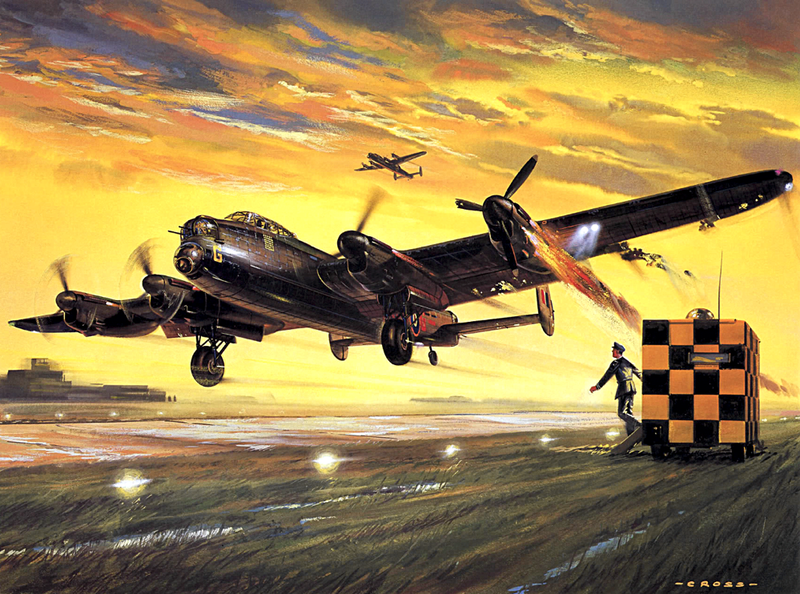 James May's "best picture ever" box top (below) showed an Avro Lancaster coming in with an engine on fire. We can almost hear the three remaining Merlin engines roaring, and the sound of emergency vehicles rushing to the scene. Royal Navy airpower (below) as visualised by Roy in the 1960s. At this point, the Blackburn Buccaneer bomber was still known as the NA39, its original design title. 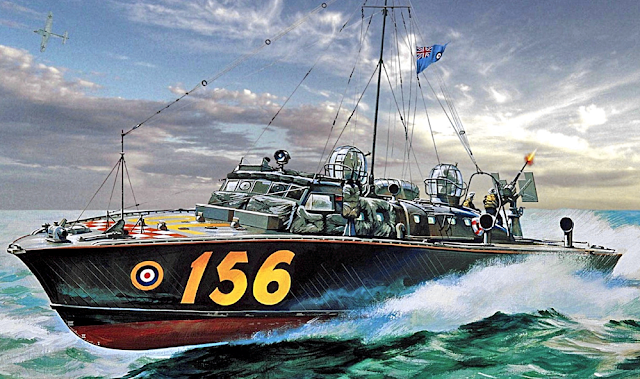 A welcome sight for many crashed airman was the RAF Air Sea Rescue Launch (below), depicted by Roy at its maximum speed of around 36 knots (67 km/h, 42 mph). 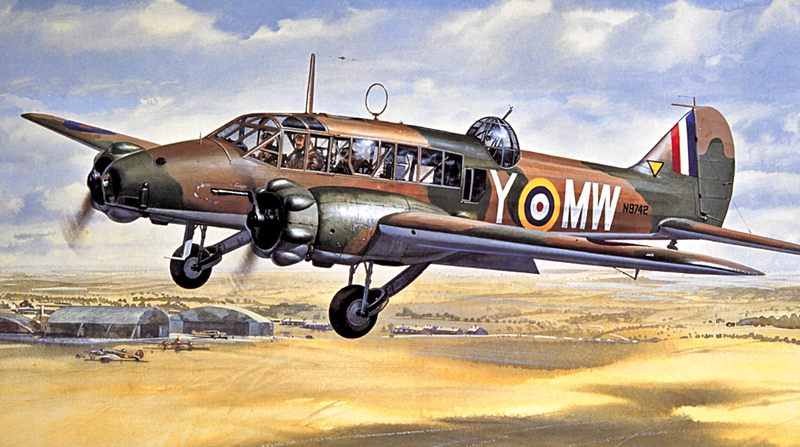 The Airfix kit is to 1:72 scale, the same used for most Airfix World War II-era aircraft kits. 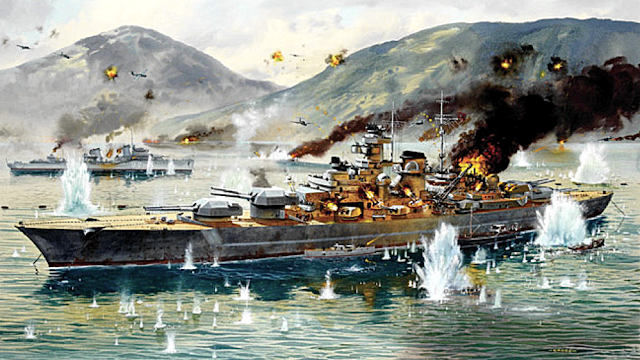 Perhaps the single most action-packed Roy Cross painting of them all (below) the German Tirpitz is depicted under attack by a squadron of Fleet Air Arm Albacore torpedo bombers. I have seen this painting closeup, and the amount of detail packed in by Roy is quite astonishing. The kit is to 1:600 scale. A gorgeously bright colour scheme was sported by many US Navy aircraft between the wars (below). 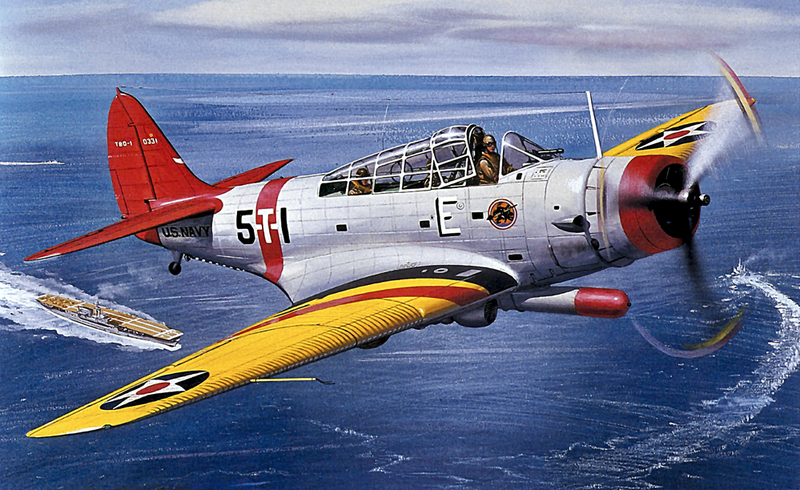 Roy painted this Douglas TBD Devastator with, once again, his trademark inclusion of interesting features. The pilot has the canopy open, ships are manoeuvring below, and the snout of a torpedo protrudes under the Devastator's belly. 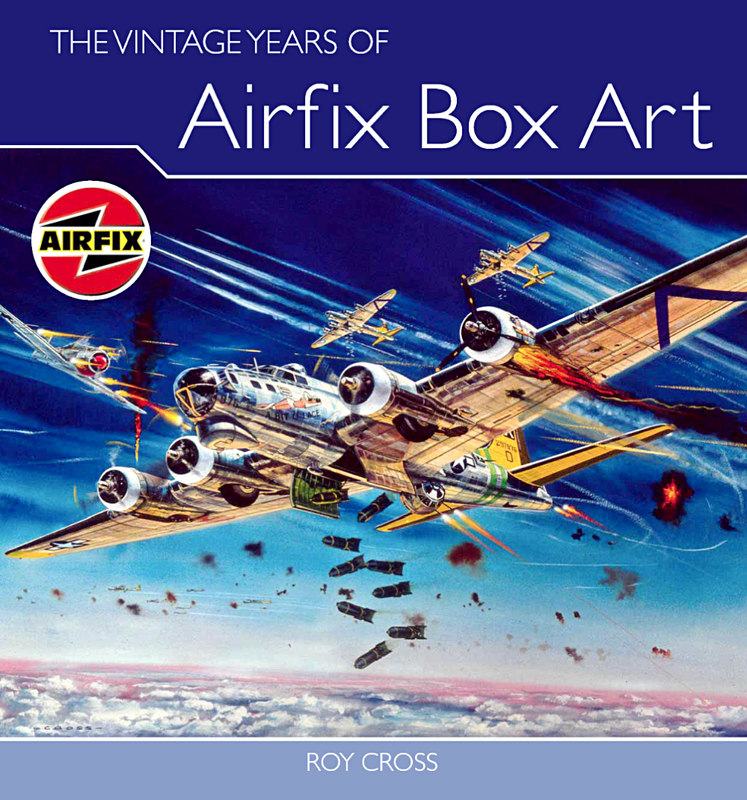 A must-have book (below) for Airfix and Roy Cross fans, The Vintage Years of Airfix Box Art is sold by Amazon. Click the ad at bottom to check current price and availability.